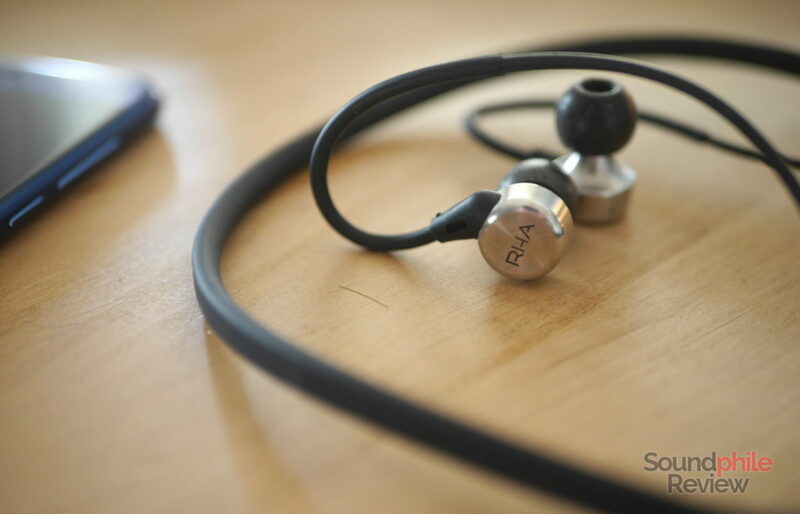 RHA gained a solid reputation inside and outside of the audiophile space as a company able to create very good products at an affordable price – they made quite the splash with the RHA T20i and its crystal clear sound. RHA is now venturing in the wireless territory to bring their sound to the crowd yearning to cut the cord, and thus the RHA MA750 Wireless were born. They are the exact same headphones that were launched two years ago, albeit with a neckband and without a wire to connect it to the source. They’re RHA’s top of the line when it comes to purely wireless headphones. Disclaimer: I would like to thank Marina at RHA for providing a free sample. You can learn more on RHA’s website. The RHA MA750 Wireless retails for $159.99. Inside the heavy cardboard box are the headphones presented in a foam tray, a metal tray that holds the eartips, a USB to USB Type-C cable and a net bag. All in all I think that’s pretty good as there’s everything one could ever need. The only possible complaint would be about the USB cable length, but that’s not really an issue in my eyes. RHA provides a wide array of eartips: there are 6 different single-flanged silicone tips, two double-flanged silicone tips and two Comply Comfort eartips. It definitely is a complete offer that can meet many people’s needs. 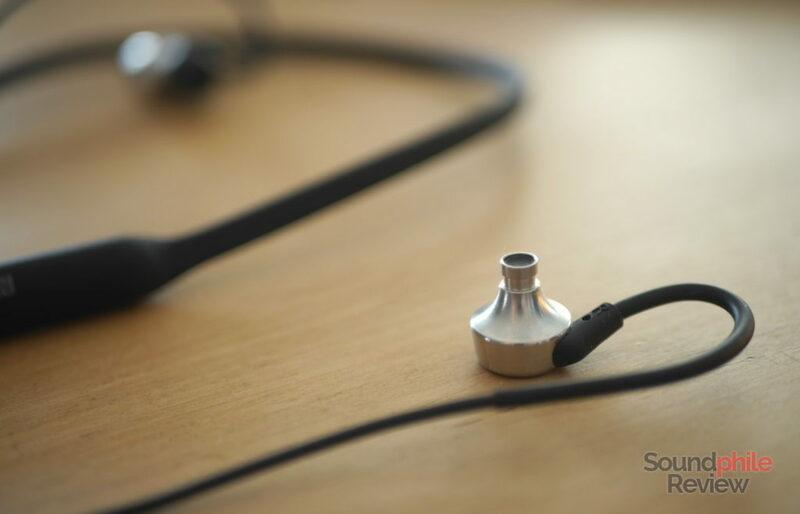 The RHA MA750 Wireless adopt a neckband design with a band that rests on the shoulders (right at the base of the neck) and the earphones that are connected to it. The earphones themselves are actually the same used for the wired model, but instead of having a jack on the other end they are connected to the neckband. The band itself is small and covered in rubbery plastic that helps it stay in place, while the two ends are made of metal etched with the brand name and model. The two ends are bulkier as they house the battery and the electronics; the right one holds the USB Type-C connector (which really is a rare sight), the power button and the status LED. The rubbery texture is functional for comfort, too, as it makes the band soft so that it sits on the skin gently – there are no hard surfaces that could cause discomfort. Extending the comfort argument, the RHA MA750 Wireless are pretty comfortable, just like their wired counterpart; the earphones themselves are among the most comfortable I’ve tried to date regardless of the eartips used, thanks to their shape and size. I can use them for hours and still feel fine. The shells are made of aluminium and are circular, with rounded shapes used in every place. The inner part (where the nozzle is) is shaped after trumpets, something RHA calls “Aerophonic design”. While it purportedly brings better acoustic properties than usual designs, it also is good-looking and makes it possible for the earphones to fit a wide variety of different ears thanks to the minimal space used and the shape not offering any elements that could be obstacles. The earpieces are magnetised so they stick together. This is especially useful as they won’t just lay around, but they’ll stand still hanging down from the neckband. I also found they can be hooked to the shirt so they won’t be hanging down either – they will be pretty comfortable and neat when not in use, which is a big plus. Like many neckband-based Bluetooth headphones, the RHA MA750 Wireless are not ideal for running: the neckband bounces and makes a lot of noise that is directly funnelled in your ears due to microphonics, so it is not advisable to use them while doing sports. On the other hand, they are commendably comfortable when used while on the go. Using the included Comply foam, isolation is really remarkable: I could listen to music at low volume on public transport without noise from outside ever making me feel like I needed to raise the volume. While it is not perfect, it is enough to severely limit the noise and leave out most of it. There is very good isolation using the silicone tips, too, though it is a notch less than that offered by the Comply tips. My only real complaint is that the cables between the neckband and the earpieces are short; I do not know if I have a longer-than-average neck, but the cables are a bit stretched when wearing the headphones and a little longer run would certainly not be a bad thing. As the RHA MA750 Wireless are lifestyle headphones, they are made to connect to smartphones and manage calls in addition to playing music. Just like the RHA MA750i, the MA750 Wireless include a microphone and an in-line remote, but they also include a small vibration motor on the right neckband end that warns you there is an incoming call. It’s especially effective if you aren’t listening to music (and therefore you don’t have the earphones plugged in your ears) yet you are wearing the neckband. The microphone works well, making the voice sound clear and at the right volume, but it has its limits as it can’t manage noisy spaces easily and it tends to let the voice drown in noise. Alas (or luckily, depending on your stance on the matter) volume is not decoupled from the source, so it will be entirely dependent on your device’s Bluetooth volume management. In my case I wasn’t lucky – my Honor 9 smartphone goes from “barely audible” to “I’M GONNA CRUSH YOUR EARDRUMS” with nothing in-between. Other Bluetooth headphones have their own volume adjustment which make it a bit easier to manage this kind of situation. My phones’ inability to adjust volume properly is of course not the MA750 Wireless’ fault, but taking these situations into account would have provided an overall better user experience in my opinion (though I do see why they chose to follow this path, as most phones offer decent volume adjustment). The RHA MA750 Wireless perfectly nail battery life performance, offering roughly 12 hours of use at moderate volume. These are good for a full day of work while also taking and making calls. As they expose their charge through Bluetooth, it is also possible to check the current charge level if using a compatible device (e.g. Android phones with Android Oreo). One thing I noticed is there is no auto-shutdown if the RHA MA750 Wireless are not actively used. As long as they are connected to a source, they will just stay in standby mode consuming energy. That’s good if you want to use them to manage calls and keep on wearing them, but it’s not so good if you forget them on your desk in the evening only to find them with the battery drained in the morning (together with your phone, of course). It’s difficult to strike a balance here, but automatically powering off after two or three hours of no usage could have been a better option, in my opinion. There is a voice that announces the battery status when one presses the power button once and also informs you of the status of the headphones (connected, disconnected, shutting down, etc). As a side note, this voice seems to have a Scottish accent, as far as I can tell with my poor knowledge of pronunciations of the English language. It seems to be neither Received Pronunciation nor American English, so this leads me to believe it is Scottish, maybe as a reference to the fact that RHA is based in Glasgow. The RHA MA750 Wireless are also IPX4 certified, so they are resistant to water splashes – wearing them while it’s raining or while doing sports won’t be an issue. 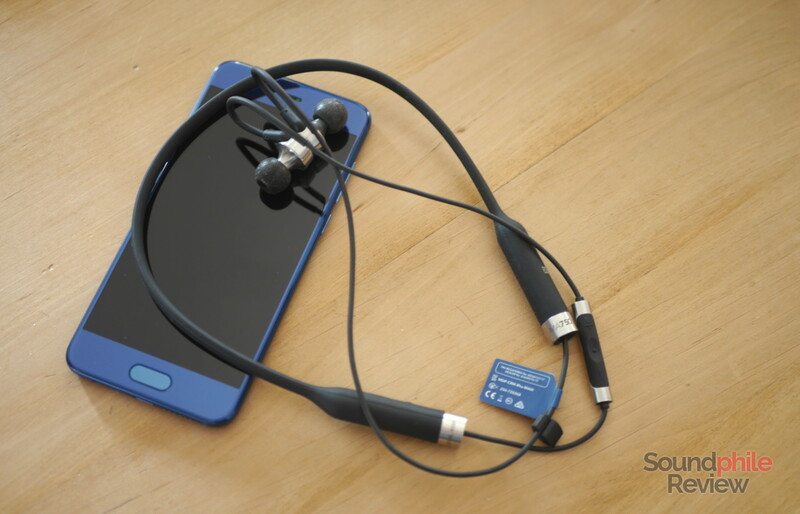 On top of Bluetooth, the MA750 Wireless offer quick pairing thanks to an NFC chip. Bluetooth has both aptX HD and AAC codecs, so you should be covered whether you use an Android device or an iOS one. It also supports the SBC codec for all the other devices and situations where the other two codecs are not found. I used both a Cayin N5ii and a Honor 9 as sources, loaded with FLAC files. Both support the aptX codec and the Honor 9 also supports aptX HD (thank you, Android Oreo!). There is a strong hiss when the DAC and amplifier are working, and it is especially noticeable during silent or quiet moments. This is a limit of many Bluetooth headphones, but it is especially noticeable here when using the headphones in a silent environment. 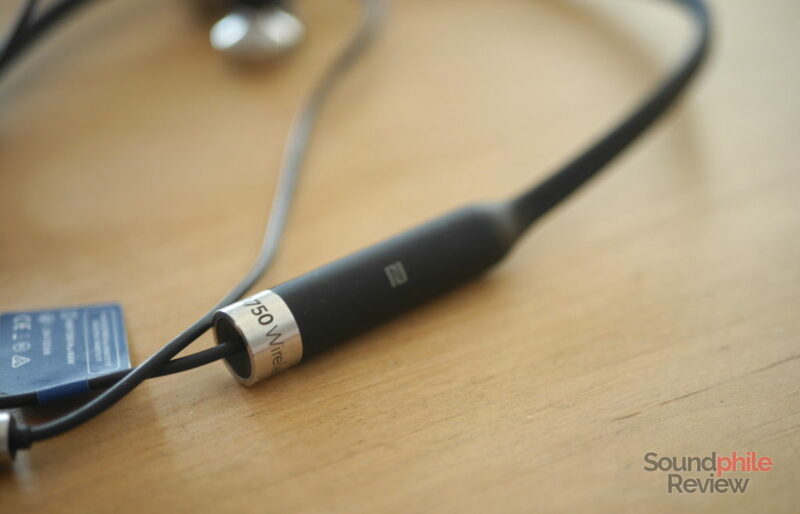 Using the RHA MA750 Wireless when out and about I could not hear the hiss directly, as it was masked by the surrounding noise, but I felt a slight sense of fatigue after a while that is probably caused by the hiss. The RHA MA750 Wireless offer the same acoustic performance as the wired model – that is to say they offer a very balanced, engaging tuning that stands out in the crowd for being especially pleasant. Some say the MA750 has better tuning than the T20i and it’s true in a sense, as the lower-end model is indeed more neutral. This is also true for the wireless model. Soundstage is decently wide, but that’s pretty much it. It is never expansive nor deep and music is therefore confined in the proximity of the listener. Imaging, on the other hand, is commendably accurate, and places instruments with good precision across the soundstage. Instrument separation is really good and lends the sound clarity. Although it can’t reach the deepest frequencies and therefore comes out as lacking sub-bass, the bass section is almost neutral and very well balanced. There is a bit of emphasis in the mid-bass area that does not influence the overall tonality too much as it adds a bit of presence but does not end up making the sound warm. It is a tad more prominent than that of the Tin Audio T2, which makes it one of the best in the low/low-mid range. When it comes to quality, the RHA MA750 Wireless shows off some good competence in managing intricate bass lines and complex situations, but it’s limited in terms of how much detail is portrayed and therefore does not have the best texturing. Midrange tends towards neutrality, with little colouration if at all. Everything is clear and laid in front of the listener with accuracy and precision. There’s no apparent emphasis on any of the parts, so whether it is violins, electric guitars or pianos, they all sound equally in the front row – as midrange is definitely in the spotlight. Just like the T20i, the MA750 Wireless has clarity as one of the main features: everything sounds well separated from the rest and laser-focused – I find it hard to describe it, and I suspect not being a native English speaker plays a part in it. It’s as if each instrument was played alone and then everything was played at the same time keeping every part intact, without mash-ups. This, together with the great balance and the reproduction of even minute details, produces an extremely pleasant listening experience. Treble is well extended and definitely present, but just like the rest of the spectrum it is neither over- nor under-emphasised. It is mostly neutral, with a gentle roll-off slope that makes it easy on the ears but leaves enough presence to be airy and sparkling. There are lots of details to be found. All in all the RHA MA750 Wireless are good for anything. As they’re very well balanced and offer very good sound quality throughout the whole spectrum, there’s no genre that sounds inherently bad or wrong. You may want some added thump for electronica or other bass-intensive genres, but that’s pretty much it – you can be quite sure these will be great whatever track you want to listen to. The RHA MA750 were a resounding success and they are still relevant after a few years thanks to their balanced approach and great technical ability. It is not a surprise then that its wireless version is similarly notable and keeps all of the positives while also adding well-done wireless features that include exceptional battery life. The MA750 Wireless are also well-built and feature a couple of smart features (e.g. the magnetic earpieces, the vibration when there’s an incoming call) that make them a pleasure to use on a daily basis. There a few cons, too, as the sound is negatively affected by a constant hiss that is especially annoying. But these flaws are not serious enough to bring the mark down too much and are easily outweighed by all the other positive things. 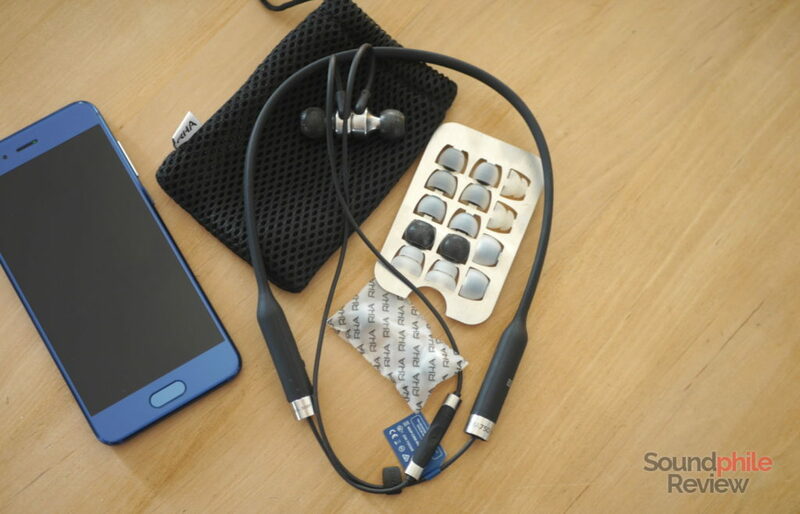 These represent the Bluetooth headphones’ state of the art right now – you will be hard-pressed to find much better alternatives on the market at a similar price.